Home » Posts Tagged "inspirations"
Amazing testimonial from my dear friend and client Mike Ridgeway! Four years ago I made the best decision of my life. It wasn’t about a job, it wasn’t about a relationship, and it wasn’t about Dream Ride Projects, but that decision would have a profound impact on all three areas of my life. My body had been ravaged by injuries sustained by three consecutive accidents while bicycling. These were not “career-ending” injuries, but nagging injuries that left scar tissue to linger and cause me chronic pain and the inability to enjoy my passion for bicycling and life in general. Barbara Searles, my massage therapist and now a dear friend and respected colleague asked me to try a new therapy she had learned called Myofascial Release. It’s now been four short years since that fateful day I said to Barb, “Let’s do this.” Four years of faith and persistence, four years of healing, both physical and emotional healing from those injuries and even some additional past injuries. Myofascial Release has done exactly what Barb promised me it would. It has helped my body get back to “healing itself,” making itself right again, and helped given me back my passion for life and my commitment to my community. It’s actually been a short four years, really, in the big scheme of life, A Blip. But here it is, I’m Back! I’m back doing the things that energize me and support my life’s purpose. And everyone will benefit from that, I promise! Thank You Barb Searles, for your dedication for your craft, and to your clients, like me who do place a little bit of our faith in your commitment to help us heal ourselves, when we chose to make that decision. This year I’m back on the road to accomplish one of my life’s passionate pursuits, a third Race Across America (RAAM) finish. 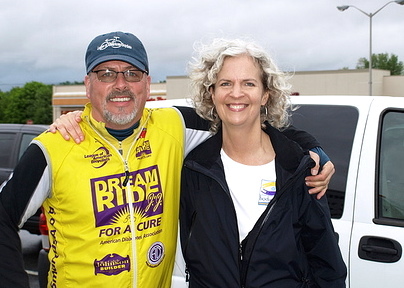 I’m dedicating my training for RAAM 2013 to Barb Searles, who helped pull me back from an abyss. My therapist, my colleague, and my Friend. I’m also working on a new board that captures a lot of Anti-Inflammatory food and lifestyle suggestions! I’d love for you to follow any of these individual boards. Or if you’d like to know more about me – what I love and what I find pinteresting – then follow all my boards! Ready to get started feeling less pain and more energy? The best way to determine what program is right for you is scheduling a FREE 45-minute initial health and wellness consultation. Simply call or email me today to get started! In the midst of all the sadness surrounding the world this week, I happened upon this poem by a twentieth-century Japanese man, Nanao Sakaki. It seems like a wonderful way to remember that each of us is just one small part in a larger whole. And reminds us that we must find quiet time for ourselves, our world and our universe. You sit, pray and sing. You sleep well, rain sounds a lullaby. Gather firewood, water, wild vegetables, and Amanitas. Where someone lives leisurely, they say. Or winter drifting ices in the sea of Okhotsk. Walking somewhere on the earth. Swimming in the sea of shooting stars. The moon in the east, the sun west. Pop far out of the solar system mandala. The Galaxy full blooming in spring. Andromeda is melting away into snowing cherry flowers. There again you sit, pray and sing.